by Kausthub Desikachar. 448 Pages. 172mm by 220mm. Hard Cover. Of all the classical Hathayoga texts, the Hathayogapradipika is the best-known, and considered one of the most relevant to modern times.The publication features the original text of Yogin Svatmarama in Devanagari and Roman transliteration form, its translation into English, word by word meanings, the full classical commentary of Brahmananda and its English translation, and the critical commentary of Dr. Kausthub Desikachar. This English version achieves the formidable task of creating a bridge from ancient source material to students living in the modern world. by Kausthub Desikachar. 78 Pages. 176 by 220mm. Paperback. This is a tribute created not only to thank Sri Desikachar for the many gifts he has brought to the world-wide Yoga community, but also to increase awareness of his unique contributions and his amazing work. This is not a biography of TKV Desikachar: it is a gesture of thanks from his students for the work he has done with such grace, gentle humor, and compassion. He has been an extraordinary figure of and for Yoga and yet has always remained humble and human. To request your free copy send an email here. Masters in Focus | Inspiring images of Yogacarya Sri T Krishnamacharya and his pupils. Edited by Kausthub Desikachar. 124 Pages. 240 by 300mm. Hard Cover. Masters in Focus is a limited edition publication that honors T Krishnamacharya and his “four-most” students - Indra Devi, Pattabhi Jois, BKS Iyengar and TKV Desikachar. The book features rare photographs of these teachers, especially from their private lives. Both archival photographs, as well as recent ones cover the pages of this artistically designed book, printed on special paper that enhances photographic aesthetics. Many of these are previously unpublished photographs offering new/fresh insight into their inspiring lives. 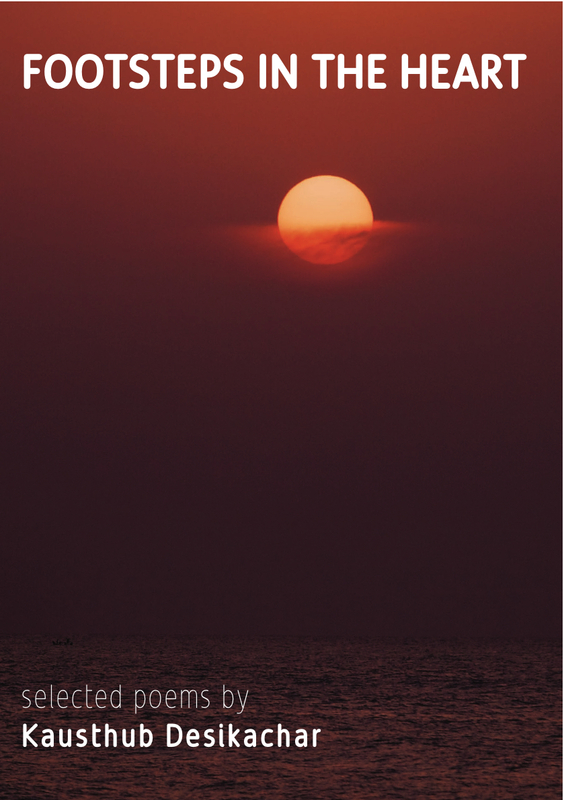 Selected poems by Kausthub Desikachar. 101 Pages. 148 by 210mm. Paperback. Footsteps in the Heart is a selection of emotive poems that invite us to spend time considering the meaning of life through love, life, death, faith and friendship. Inspired by profound experiences, these simple yet symbolic verses are deeply evocative and unravel many layers of meaning. This work invites the reader to unhurriedly assimilate its words and reflect on their significance through the prism of one’s own life. Footsteps in the Heart will appeal to every reader who wants to be reminded of the potency of each moment of life, and how every such moment is indeed a gift. This deeply personal biographical tribute by Krishnamacharya’s grandson includes photographs, archival materials, and family recollections that have never been published elsewhere, as well as unique insights into the “master of masters” by some of his most famous students–Indra Devi, Sri K. Pattabhi Jois, B.K.S. Iyengar, and T.K.V. Desikachar. First published in 2005 by the Krishnamacharya Yoga Mandiram, The Yoga of the Yogi is at last available in a portable paperback format. Yoga Makaranda | The Nectar of Yoga. Yoga Makaranda was Krishnamacharya’s first book on Yoga, published originally in the Kannada language in 1934. This book was one of the very few available on the subject of yoga at that time, and also the first one to present the practice of Asana-s in a sequential manner (Vinyasa-krama), a method unknown at the time to the general public. 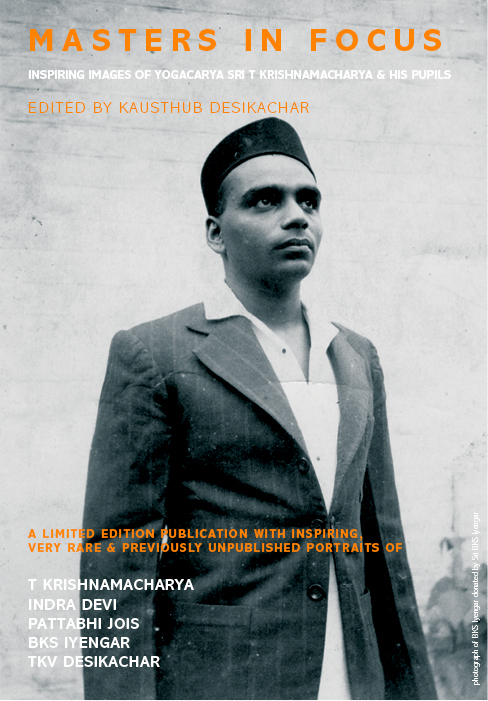 The English version, translated by TKV Desikachar, son and long time pupil of Krishnamacharya, presents some of Krishnamacharya’s earliest teachings and features ninety-nine archival images of the master himself and his students at the time. It also contains beautiful illustrations of the sequences listed and expository notes by Dr. Kausthub Desikachar to guide the reader towards a profound and erudite understanding. 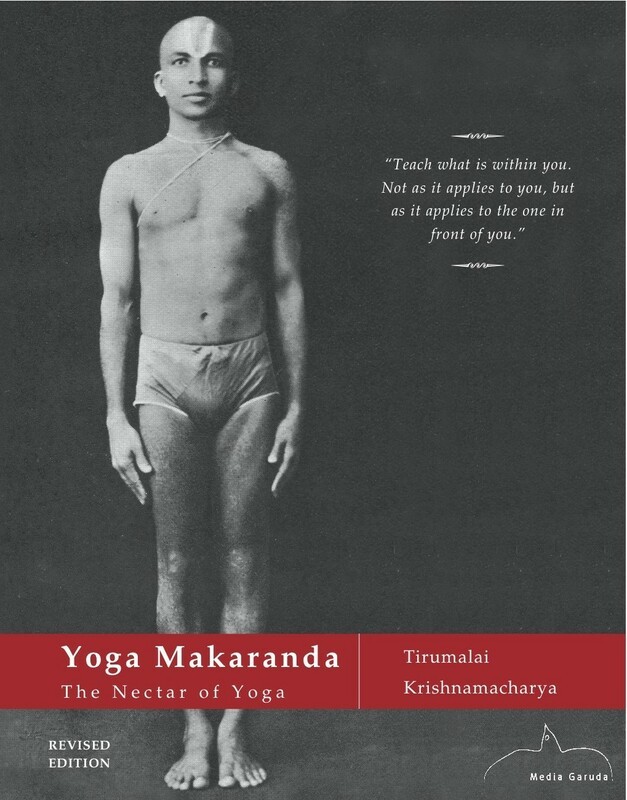 Yoga Makaranda will be a jewel in the personal library of every Yoga practitioner, and an invaluable asset to researchers interested in a more accurate understanding of a vital aspect of Krishnamacharya’s teaching. Purchase a paper back copy here. Purchase this as ebook in itunes here. 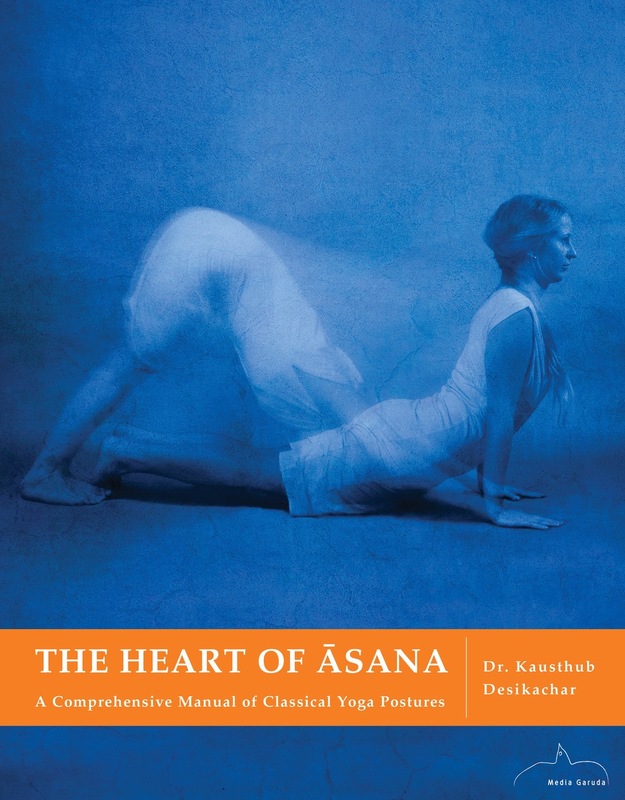 The Heart of Asana is a multilingual guide containing a wealth of information on the mindful practice of traditional Yoga postures in the Vinyasa-krama style. Richly illustrated, it covers various aspects of Asana-s, including meanings of Asana names, its classification, notes on significant areas of detail, role of Bandha-s to be performed, classical source texts that describe the posture, common variations, its classical Vinyasa-s and much more. These are presented in English, Spanish, French and German in a reader friendly layout designed to appeal to both beginners and advanced practitioners. Regardless of the tradition of practice, this meticulously researched text featuring 234 Asana-s and 579 Vinyasa krama-s, will prove an invaluable resource to students seeking to engage in a diligent practice of Asana-s with a holistic awareness of their technique and subtleties and to thereby unravel their true, potent purpose. The Veda-s are ancient scriptures in the Sanskrit language. Traditionally, it is believed that the Veda-s are the breath of the Lord and hence eternal, not composed by humans but revealed to ancient seers while in a deep meditative state. Considered complete and impeccable, they wield high influence on Indian scriptures and are held sacred by millions to this day. Due to this belief in their divine origin, even those Vedic verses where the rules of Sanskrit Grammar seem to be violated, are recited unchanged. 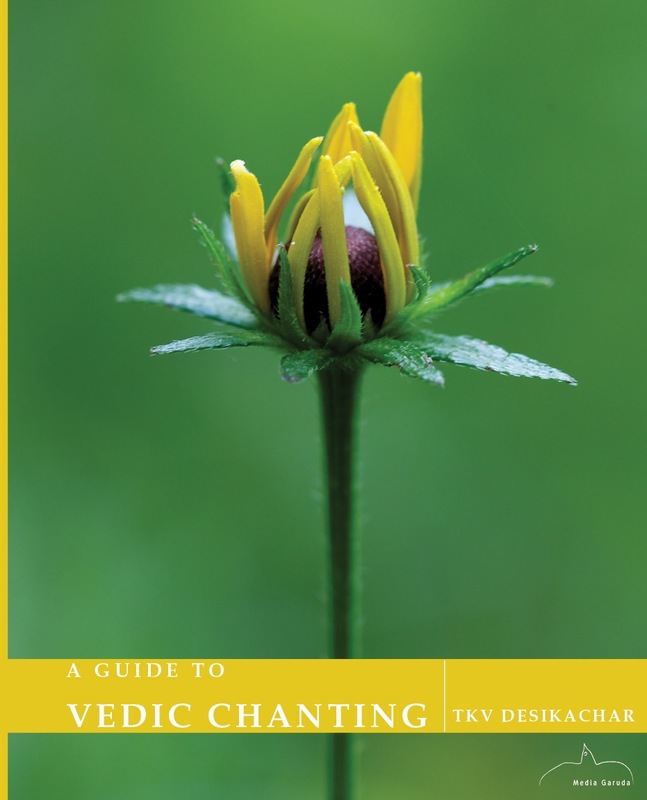 ‘A Guide to Vedic Chanting’ has been compiled to orient a beginner in the art of Vedic chanting to its history and technique. It will serve as a useful resource when embarking on the magical, potent journey of sacred sounds.